Standard fishing gear – some great catch have been landed from the jetties, why not give squidding a go. Use of surf boards and body boards, we have the Solomon's largest range - Short boards, Fish shapes and fiberglass and Firewire Mals, Quads Diverse 6’ 2 , Pipe Dream Bonzas 6’4, 6’10, 6’6 , Thrusters - MJ 6’6 , Jack Knight 6’, Wiz Stik 5’10, Diverse 6’0, JS 5’11, Pipe dream 6’8, Stuart- 6’1 x 19 x 2 3/8 truster, JS - 5’11 x 18 x 2 1/4 = 2 1/4 = 25.6 litres thrusters, Diverse 6’ x 21 x 2 PLUS a bunch of other boards for your use. VuBoards – great for coral viewing over the reef, you don't need to get your face wet. Grab a book or magazine from our library, take a bush walk with our staff in the rain forest and learn about bush foods. Swim in the rain forest water holes, a great place to relax from the mid summer sun. Kids, we can guarantee a special time for kids and that they leave to retreat learning great things about the way of life in the Solomon's. Local crafts, bush walks and customs stories will be shared. Baby sitting and child minding are available for your entire stay, please enquire. 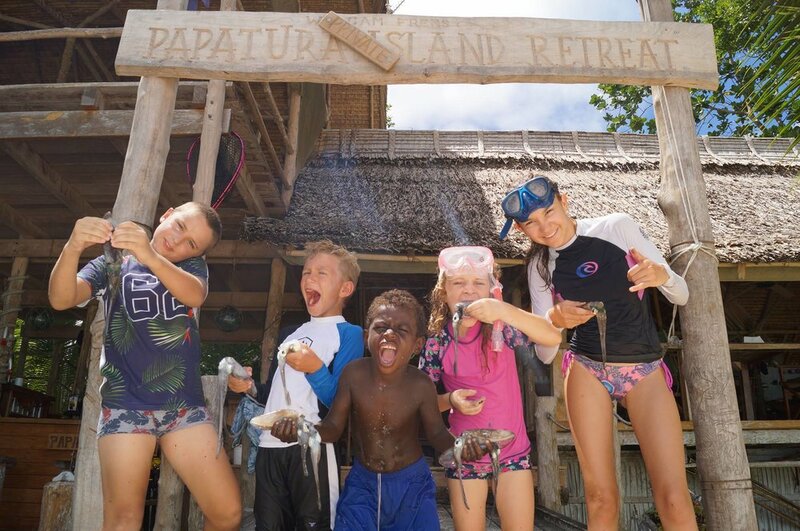 Kids can learn to fish, sail or collect food the Solomon way.